Fervent pleas for �sanity� by the Pakistani media and international pressure may just have averted the possibility of a military coup but political uncertainty and a potentially dangerous standoff between the military and the Government kept Pakistan on the edge today. At a time when the Congress is using every possible ploy to woo the Muslim vote in the upcoming crucial Uttar Pradesh Assembly polls, it was placed in an embarrassing position today with Home Minister P. Chidambaram emphatically denying AICC general secretary Digvijay Singh�s charge that the three-year-old Batla House encounter in Delhi was fake. The Election Commission of India today transferred Senior Superintendent of Police, (Vigilance wing), Ludhiana, Surinderjit Singh Mand out of the state for allegedly �misusing his authority and official vehicle� for transporting cash belonging to the ruling party. India is keeping a close watch on the developments in Pakistan and hopes that the stand-off between the civilian government and the Army will not have a bearing on the dialogue process between the two countries. 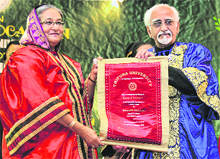 Vice-President Hamid Ansari today conferred honorary Doctor of Literature (D.Litt) of Tripura University on the visiting Bangladesh Prime Minister Sheikh Hasina in presence of an august gathering in the university auditorium. US President Barack Obama has said his administration will soon come out with policies to reward companies that bring back jobs from overseas and invest in the US. At the same time, he has vowed to eliminate tax breaks for companies that move jobs overseas. It has been a long wait for the parents and the relatives of hundreds of missing children in Haryana. With the police failing to make much headway in tracing the missing children, the kin of the missing children are forced to move from pillar to post in search of their children. In one of the biggest fake currency rackets unearthed in the country, the Delhi Police today seized counterfeit notes worth more than Rs 6 crore. It seized two trucks at Dabri, South-West Delhi, which had the currency hidden between 33 bundles of clothes. The police is currently counting the cash with the assistance of the Central Bureau of Investigation (CBI) and the Reserve Bank of India (RBI). The final figure for the sum confiscated is likely to be much over Rs 6 crore. The Commissioner of Police pointed out that the money was procured from a foreign country.